A Beautiful and Insightful Journey! I knew it was about to happen again. My world was about to be illuminated in ways I could’ve never imagined! I noticed over the years my teaching styles were being lured into this beautiful and luminescent realm of healing energy, and it was much more gentle, more quiet, more Yin! It was calling to my soul, and the music was beautiful. I was ready to begin the journey, but what that was exactly, still remained a mystery. This new sense of change carried many questions like, “what does this mean?”, “what will I discover?”, “will I still teach Pilates?”, etc. With so many unknowns, I did the only thing I knew how to do. I continued seeking out amazing healers and teachers to teach me tools to live my best life, continued healing myself on all levels, continued checking in daily to my internal rhythms and conversations, continued dancing and performing, and continued teaching! As the current always brings forth a rhythm of discovery, I found my flow in this next chapter! Turns out that music was the most intoxicating vibration to ever grace my ears, and it moved my body to newly enchanted rhythms! It began with finding MELT and Sue Hitzmann, my teacher and MELT creator. Learning how to self-care with these techniques changed my life! And beginning my journey of learning how to teach MELT to others, well is incredibly empowering! Next, my journey transcended another level when I lived in the mesmerizing mountains of Colorado at Shoshoni Yoga Ashram for a 200hr Immersive Yoga Teacher Training. All my past ideas and flirtations with meditation, Ayurveda, mantra, ceremonies, and many other elements of the Yogic Path came to life at Shoshoni. The techniques learned, and the deep sense of quiet and stillness that was awakened forever changed me! Finally, I completed the next level of MELT training with a fresh perspective from life at the Ashram! Ashram life gave me the taste of how our subtle body and emotions play a deeper role in our self-care, and during that next level of MELT training my desire to blend a yogic environment into my MELT sessions was birthed! 2013 brought about MELT and Yoga training for me. 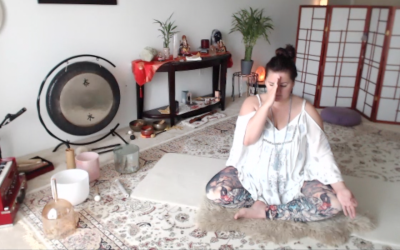 And was truly about pushing myself to greater limits, challenging what I thought I knew about life, the living body, emotions, the spirit, how to help people live their best life, and how it all balances out and flows … I discovered the art of a quiet more yin style of living and teaching. Through the fear, tears, joys, and love I danced with my heart on this beautiful and insightful journey!